How do humans react to sound? Each way to reduce stress and anxiety is healthy. The dentist that uses music to relax frightened patients knows this instinctively like every business lounge that puts some relaxing background music on while people wait for their turn. But the details about how, why and where in the body music contributes to help people are still being investigated. Nevertheless, there are many uses that already show the healing effects of music. 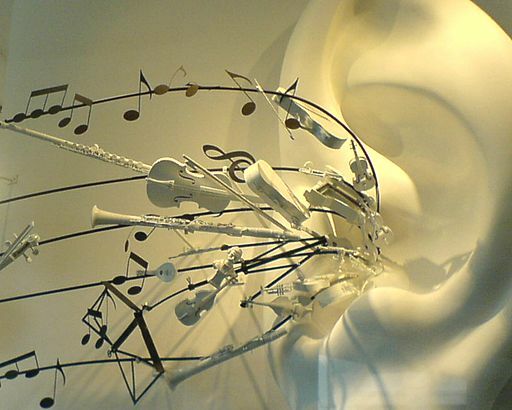 Music therapy uses sound and rhythm to heal. For people who have problems to communicate, many institutes engage music therapists to help these persons to express themselves through music. Did you know that when someone starts to sing, automatically the sensation of fear is erased? That therefore it is very advisable to teach children to sing whenever they feel alone and unprotected. You forget fear when you start singing yourself. The “altruistic” hormone Oxytocine, that accounts for feelings of trust and empathy, is a well known and searched for element. Well, there is a spot in our brain inside the amygdala (the secret master of our emotions) where this hormone is released whenever we hear music that we perceive as pleasing. Listening to music we love makes us be nicer to other people. Music with “musical depth” makes us happy. I bet you don’t need a scientist to tell you that! Sound patterns stimulate the limbic system, the central station for our feelings. Experiments have shown that (western) people listening to classical music did recreate the structure and meaning of the music in the frontal areas of their brains. That’s where the limbic system has it’s headquarters. At the same time, this limbic regions released the happyness-hormone Dopamine. And last but not least, the brain was able to register variations in velocity, rhythm or timbre. These variations resulted in a positive tension, in the interpretation of the scientists conducting the experiment. Even for elder people music can help to prevent senile symptoms as it can activate unused brain connections and enhance brain activity. Often elderly people that have problems to recognize their family can evoke the past through music which they recognize from childhood or early years. Relax, what a wide range of significance! Everyone feels different things with each music style. What is relaxing for you may be a pain for your neighbor and viceversa. Relaxing music is what makes us feel at home, in our private castle all by ourselves and our loved ones, even when we are in another place. And just as room decoration, it is not about what colors you use. We can also affect our well being with the help of the right environment. We have a way to create the perfect home environment trough music. You can choose your own background music for the special moments in your life or just create one for yourself if you don’t find what you are looking for. Listening to relaxing music while driving can help you to prevent accidents. Drivers that get stressed and distracted have a greater probability to suffer any accident than a relaxed driver. Studies show that drivers who listen to relaxing music are very seldom the cause for accidents. Some Spa and Wellness Centers use relaxing music as audio backgrounds for their treatments. If you ever heard of Liquid Sound, this is a new technique that uses underwater music with colored light and spheral sounds while being submerged in a flotation tank. People submerge in a tank with salty water that is closed and dark, and relax almost forgetting gravity while listening to special sounds and seeing some tenured light effects. It’s supposed to be super relaxing. People keep awake floating but are very relaxed. The sounds stimulate the mental relaxation. The influences in a child’s first four to five years remain for the rest of his or her life. Children are especially sensitive to environmental sounds. Even during pregnancy the unborn child reacts to environmental sounds. Relaxing musical backgrounds that help pregnant women to relax can benefit their children. Children that hear relaxing and soft music in their earliest day and months have a better sleep. Of course, one of the best background sounds for children is their mothers voice singing a lullaby. Small children are very sensitive at sounds. They not only hear better than many adults, they also react with basic instincts to sounds. A loud and sudden sound causes fear and stress to a baby, whereas high pitched sounds with regular beats can help to put them to sleep. Not only children profit from a sleep favoring audio background. Also stressed workers who find it difficult to wind down should indulge themselves in short breaks to calm down. A 15 minute break with some relaxing background sounds can prevent feeling overclocked, overworked and suffer from stress symptoms like insomnia, obssessive thoughts and restlessness. It bring you back to earth and enhances the decision making abilities you need to go through your daily life. What makes some music a literally sleeping pill? More than boredom it is steady and long sound carpets without disruptions. Variation while standing still is how you can describe this sort of sounds. This is circular music, imitating things that make us feel comfortable, at home, quiet. Elements of sleep music often are heartbeats, slow rhythms and natural repetitive sounds. Classical meditation like Zen does not use music. The purpose of meditation in these cases is total rest of any thoughts and conscious brain activity. Being said this, there are many people fond of mediation music for their regular meditation practice. It can serve to neutralize external disturbing sound sources, and it can help to let go of thought while concentrating on the sounds. This kind of music needs slow rhythms with long phases, as our hear beat unconsciously tends to adapt to the music beats: Hard beats and bass rhythms accelerate the heartbeat while slow motion and soft music tends to slow down also the rate of our hearts. Therefore many meditation audio backgrounds include nature sounds. A steady rain falling, sounds of ocean waves and seagulls, forest sounds and fireplaces can be the choice for anyone that calms down in this kind of environment. In fact, reading and talking to people reveals that there is a whole universe of music that suites any imaginable use of music and sounds. There are also people that prefer nature sounds or sounds of materials with special sound characteristics like Singing Bowls because of their broad overtone spectrum and complex timbre. From a neurological aspect, during meditation our body just slows down. Heartbeat slows down, the brain waves alter, breathing gets deeper and muscle tension is released. There are different types of meditations, but a first division is between passive meditation like in ZEN and active meditation like in yoga, martial arts or mantra singing. For active meditation music can be an essential element. For this purpose music and sounds have to be calm. It is not only relaxing music like it could be a smooth jazz or electronic chill out for your nights on the porch. It has to be static and repetitive, without sudden rhythm changes or surprising harmonics.This applies even to music for shamanic or other trance states, where it can be quite rhythmic but still very repetitive. Some find it boring, but that is searched for if you don’t want the music to steal the protagonist to your meditation. Meditation music in its ideal state puts the person to vibrate to it. How can sound or music enhance your concentration? Daily stress and pressure are the natural enemies of mindfulness. In order to be present at the moment, we need to be relaxed and shift the focus to the inner peace that is always there in everyone of us behind the busy and worrying thoughts of daily life. This is what relaxing music helps us to do. Some people think music is essential for learning because it stimulates the right part of our brain, and thus we can enhance our attention and brain capacity. Other think this could be more a sort of placebo effect. Anyway, it seems that if you hear a special piece of music during memorization and automation learning processes, this will help to memorize by association the things you learned whenever you hear the same music again. Being aware and concentrated is part of the meditation process. It is the first step before cleaning your mind and letting your real self emerge out of the chitchat in your brain. Many say that in this process you should not listen to music. But there can be situation where an audio background can help to concentrate with environmental sounds or some noise that reduces other environmental background sounds. A bit of white noise can help to forget about the far away noise of a motorway or a railway station. Thanks for sharing. Your Post help me out during my meditation workout. Always Keep Posting. Check and tell me your opinion in comments to video! SUBSCRIBE and receive notifications each new track, which we plan to add weekly! Thank u very much! It’s great and really good to learn about relaxing music.